It’s interesting that mass paperbacks keep falling lower and lower. I read both novels and ebooks and personally all the books that are in mass that I want to read cost MORE or about the same as an ebook version. I’d rather have the tangible product at that point. Hi Ethan, thanks for stopping by and for the comment! Most readers I’ve talked to agree with you — as do I — that e-books should cost less than the least-expensive print version of a book. I think we’re seeing that more and more often (and that will continue to be the trend), because it is undeniable that there are some savings with e-books. And I think they should be passed on to the reader, although there is not always agreement over how much those savings really are. Personally, I think e-books should be much less expensive that paperbacks (hence why I price mine at only $2.99). But there should certainly be some savings. As more and more e-books are priced reasonably (below their mass-market counterparts), I think we’ll see MMP sales continue to suffer. 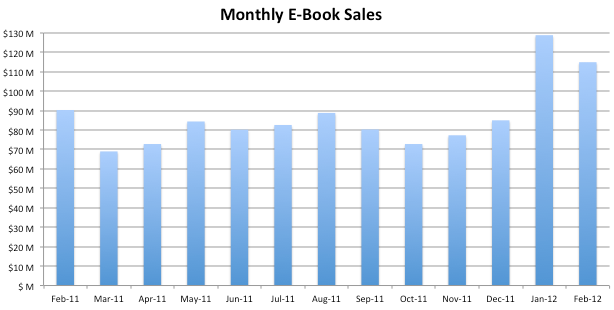 The data I’ve been finding does not break down number of e-books sold, just by dollar amount. Sorry.